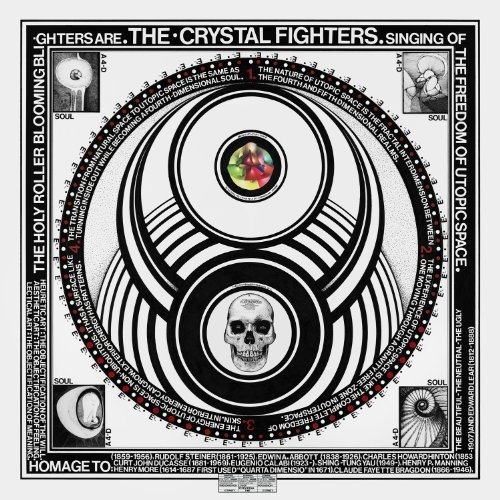 The second album from Crystal Fighters, titled Cave Rave, is the perfect summer soundtrack. Soaring vocals are set against an joyful, tropical beat which is rich in percussion and interlaced with delicate electro. The album mixes Basque folk music with electronic and dubstep creating a unique and exciting sound. For anyone unfamiliar with the band, Crystal Fighters comprise of four members: Sebastian Pringle, Gilbert Vierich, Graham Dickson and Eleanor Fletcher. Part Spanish, part British, the band formed in 2007 and have been experimenting with different musical styles ever since. The name 'Crystal Fighters' comes from an opera found unfinished in the house of a past band members grandfather. The unfinished opera provided a great source of inspiration for the band, not only providing them with their name but also the basis of their first live show. Tales of endless summers, wanderlust and love are told through a mix of female and male vocals that sing cute lines like "Bathed in sunlight, cold as cash is hot as lust is, where my heart is." You can easily feel transported to some tropical paradise with balmy summer's air and sun bleached surroundings when you listen to Cave Rave. At times it has hints of the preppy sound Vampire Weekend are known for and at other times the music appears closer to Arcade Fire or Wild Belle.